Fascinated by his grandmother’s hotel kitchen in Denmark, Henning attended culinary schools and did apprenticeships throughout Europe and the U.S. Specializing in Danish, German, American and French cuisine, Henning brings an international pedigree to the table at Fox Hill. 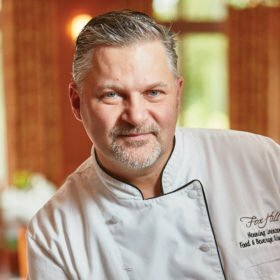 Before joining Fox Hill in 2008, he co-owned and operated Henning’s in Frederick, Maryland, and Wurzburg Haus in Derwood, Maryland, one of Washingtonian Magazine’s Top 100 Restaurants. He also was Capitol District Chef for Marriott Management Service, Executive Chef at the World Bank in Washington, D.C., and Chef at Sydney Opera House. Learn more about Fox Hill by downloading our free interactive brochure.